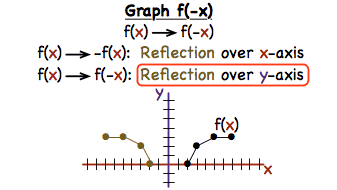 How Do You Graph a Reflection of a Function? If you change a function like f(x) to f(-x), it flips the function over the y-axis! Follow along with this tutorial to see how to take a function and reflect it over the y-axis. When you look in the mirror, you see a reflection of yourself. Reflections in math involve flipping something over a line called the line of reflection. This tutorial shows you how to reflect a function over a chosen line!